As we landed in Las Vegas on Wednesday, the glitzy skyline of the “Strip” was in our sights, and (I suspect) the primary focus of my fellow travelers. 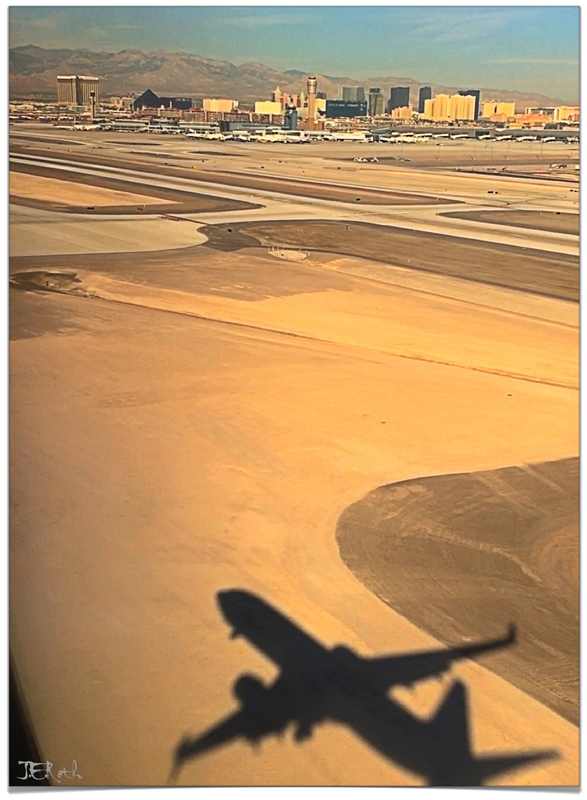 I noticed that as we neared the ground, the shadow of our plane grew larger and closer, until touchdown, when the shadow merged with the subject. This photo captures that penultimate, (extra) ordinary moment. Love this, Joanne. The dramatic approach of the airplane-shadow is deflated by the acres of runway-desert & the somehow-not-promising lineup of… Skyscrapers? I watched our shadow as we were about 5 miles out (I think) and as we got closer to the ground it got bigger. It was fascinating to see it disappear at the moment that we touched the ground. normally i am a white-knuckled flier, especially take-offs and landings, but this time I was so absorbed by the unfolding drama, I almost forgot we were landing!